This 1980 Clannad recording from a live concert in Bremen finds the group at a pivotal moment. The decade in front of them would bring chart success and a swell of praise. They were set to write stunning songs, allowing their voices to transform the way that Irish music was recorded and experienced. 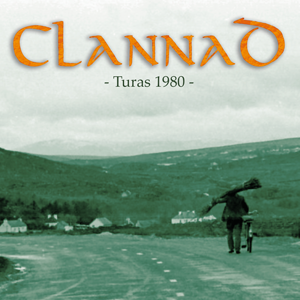 Across the 80s, Clannad created themes for film and television and carried off awards and the unqualified respect of their peers. They would connect with Bono from U2 plus the Californian rock elite. Most importantly, their future was set to make a personal impact on millions of listeners far beyond their domain of Donegal in the north-west of Ireland. You can hear much of that potential in this 1980 live concert. There is little in the way of studio effects. The band is reliant on their individual skills and their capacity to mass together when the moment needs it. A sister, two brothers and two uncles. The family from Dore: Clann As Dobhair. Conditioned by the wild coastline and by the resonance of Irish, their first language. Many of the traditional songs were fetched from the locals. Moya, Ciarán, Pól, Pádraig and Noel would travel around the townlands and islands with a reel-to-reel machine, capturing the airs and the stories of another generation. Songs of rapturous love, emigration and revolution. An old woman on Tory island gave them ‘Níl Sé’n Lá’ – ‘It’s Not Yet Day’. They were true to the sentiments but Ciarán played jazz bass and the song became a faithful show-stopper. Meantime they had met with the legendary fiddle player and tinsmith John Doherty and he spun them a great yarn about a magic, uncatchable tune that was always just one field away from the enchanted follower. ‘Paddy’s Rambles Through The Fields’ was an invitation to get fantastically lost with brother Pól and his flute. Also, their beloved Grandfather, Gog, had introduced them to the poet Cathal Buí Mac Giolla Ghunna and his work ‘An Buinnean Búi’ – ‘The Yellow Bittern’. The unfortunate bird is thirsty, but the poet may have drunk too much. Clannad dated back to 1970 and the father’s pub, Leo’s Tavern. The dad had toured with the Slieve Foy Dance Band but this physical home for music allowed the Brennans and the Duggans to nurture their own art, crossing the tradition with the new tunes that were carried on the airwaves of Radios Caroline and Luxembourg. They sang The Beach Boys in Irish and covered songs like ‘Norwegian Wood’. None of this diminished their affection for Turlough O’Carolan, the blind harpist from three centuries before, or the more recent, love-wrecked lament of WB Yeats and ‘Down By The Sally Gardens’. Clannad became a professional band in 1975 and played their first German tour that year. By 1980 they were a very welcome feature on the continent and this set of recordings defines an era for the band. The tracks have been gathered from their first three studio albums and also look forward to their Crann Úll release later that year. The music is played with beautiful intimacy, but never beholden to the tradition. Europe loved and supported the family and you can hear the mutual affection in the Bremen concert. Clannad were poor, jobbing musicians who travelled in unreliable tour vans. During one stressful German trip, they were forced to use a coat hangar as an improvised clutch. It was frequently a great effort to get the music out. Onstage though, Clannad left the limitations behind. And when they made an emotional return to the Donegal stage in October 2017, they reconnected to so many of these old songs and their momentous associations. They were singing as Gaeilge and their journey – an Turas – was powerfully met.